At Ethan’s 4-year check up, I expressed my concern that he’s not forming letters (or anything identifiable in any way) when he ‘writes’ and colors. Luckily, our amazing pediatrician soothed my fears right away, noting that he’s right on track for his age. Phew! One of the suggestions she made was to let Ethan play with a dropper, which helps develop his hand muscles. 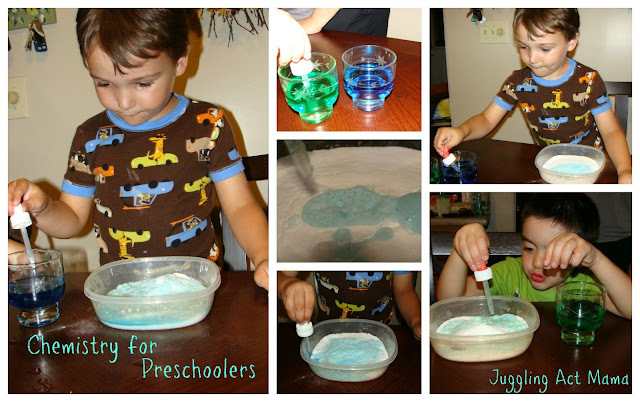 Enter this fun science experiment for preschools using baking soda, food coloring, vinegar – and a great friend, of course – and you’ve got a super fun activity learning activity. Here’s what we did – we filled a plastic bowl with baking soda for each child, and gave them a dropper – I used old medicine droppers, washed and dried. Then we poured white distilled vinegar into small cups and added a few drops of food coloring (sadly, I was all out of red, much to the dismay of Ethan, and his buddy since in utero, Peter). The boys had a blast squeezing the droppers to make it ‘puffy.” Mr. Juggling Act gave a mini chemistry lesson to the two boys, who were far more interested in the activity than the ‘lecture.’ Neither Peter nor Ethan wanted to stop until every single speck of baking soda was ‘puffed up.’ When they were done, we poured the leftover vinegar into the bowl and watched it foam right up to the top – I wish I’d gotten a photo of that – or better yet, of their faces! Regardless of the fact that the boys didn’t get the science experiment aspect, they were learning about cause and effect, strengthening those all-important hand muscles, and arguably most important – having fun with one another! PS – here’s a great resource for understanding the stages of development for wee ones through preschool and kindergarten in terms of writing and drawing. It also has some great tips for ways to encourage your child’s creativity and skills. Linking up today with Momma Mar’s Activity Corner. An outstanding share! I have just forwarded this onto a co-worker who was looking for something like this for her daughter. I think that chemistry for preschoolers is just an amazing idea. 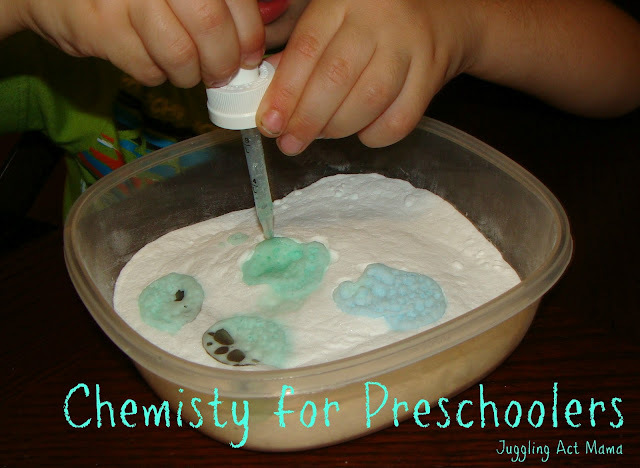 This chemistry experiments will develops creativity and love to science in kids. It’s really amazing that you are sharing this type of content. I believe that it helps a lot of kids and their parents to spend their time with lots of fun! Thank you for sharing this interesting, positive and useful article! I hope that you will continue sharing this type of content!